called enemies back in the United States … but for how long? Adjusting to a new culture is difficult. Every chore is tiring, school is miles away, and there’s always the threat of a lurking lion that can ruin everything. But after spending time with the children and Christian women in her friend Sunday’s remote village, Riley finds herself growing stronger and praying for God to use her to spread the good news. Her prayers are answered in exciting and startling ways when she meets an orphaned girl seeking answers at a children’s home, but also when an error in judgment causes her to stumble into a surprise meeting with the enemy. 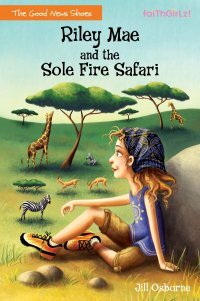 "Riley Mae and the Sole Fire Safari" is by Jill Osborne and is the third book in the Good News Shoes series. Riley Mae Hart is a pre-teen "spokesmodel" for running shoes. She has the opportunity to travel to Kenya, Africa for her next ad campaign! Riley loves to run so when she learns that Kenya is the perfect place to train for running, she gets very excited. She and her friends also need a great place to hide from enemies in the US, so off they go to join other Olympic athletes in Kenya, Africa. Riley is a good character who has a strong faith in God. She spreads the Good News of Christ to those she meets on her adventures. Although she struggles with the differences in the culture in Kenya, she eventually grows to love life in the village. Unfortunately all is not safe and carefree for Riley and her friends. This is the first book in this series that I have read. Although I did enjoy the adventure I feel I may have missed some information because I have not yet read the first two books. I highly recommend starting with the first book in this series. It is a great story for young girls who strive to live their faith even when things get tough. Disclosure: I received free the item(s) mentioned in this post through the Book Look Blogger Program in exchange for my honest review. Regardless ~ All my reviews are my honest and personal opinion. I am disclosing this in accordance with the Federal Trade Commission’s 16 CFR, Part 255: “Guides Concerning the Use of Endorsements and Testimonials in Advertising.”.